Designing a biorefinery involves the selection of the set of products and the technologies that will be used for processing a given set of biomass feedstocks. Biorefinery design methodologies have relied either in conventional conceptual process design, where the set of products and technologies under consideration is fixed, or on the optimization of processing networks where multiple products and technologies are considered and the best biomass-technology(ies)-product(s) set is found by solving a mathematical programming problem. Both approaches implicitly assume a single actor biorefinery; this is that conversion of biomass is carried out by the same facility. 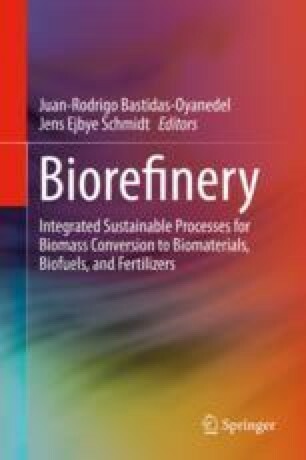 In this chapter, a novel framework for the analysis of biorefinery processes is discussed. The framework considers that, akin to the current petrochemical industry, the biomass-based industry should be designed as distributed multi-actor processes. The chapter starts by commenting on the current structure of the petrochemical industry and motivating the need for a distributed biomass-based industry. After reviewing the approaches commonly used for the design of biorefineries, the distributed framework developed by the authors is presented. The chapter ends by discussing a modified version of the framework useful for screening processes at early design stages. The authors Ana I. Torres and Muhammad Tahir Ashraf have equally contributed.